Finance Minister Yanamala Ramakrishnudu inaugurating the Lalithaa Jewellery showroom in Vijayawada on Monday. Vijayawada: Finance Minister Yanamala Ramakrishnudu inaugurated one of the biggest jewellery showrooms in the world, Lalithaa Jewellery showroom, situated on Pinnamaneni Polyclinic Road here on Monday. 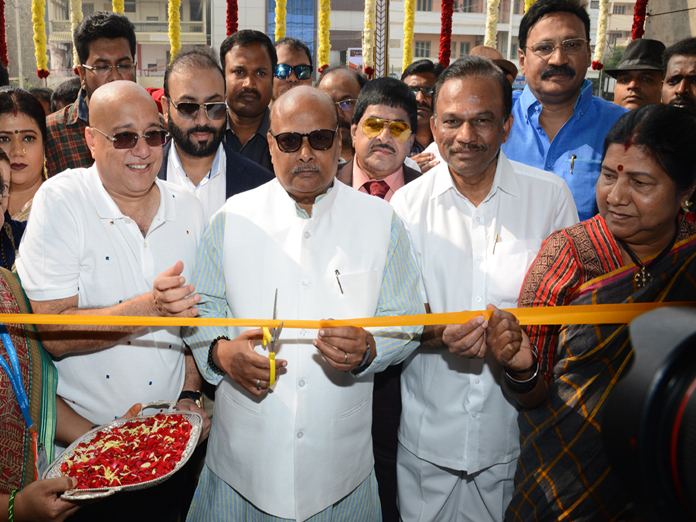 Lalithaa Jewellery has earlier opened branches at Tirupati and Vizag in Andhra Pradesh and inaugurated the magnificent showroom in a plinth area of one lakh square feet in Vijayawada. Lalithaa Jewellery is a household name in South Indian cities for many years and well known for maintaining good quality and offering variety of designs in ornaments. The showroom gained reputation for selling the gold articles at very low price in the market. Speaking on the occasion, Yanamala Ramakrishnudu said that he was delighted to inaugurate the biggest jewellery showroom in Andhra Pradesh. He welcomed the Lalithaa Jewellery saying that the capital region of Amaravati should get such prestigious showrooms. He announced that the State government would extend all kinds of cooperation to promote trade and industry in Amaravati. He said Managing Director of Lalithaa Jewellery Dr M Kiran Kumar became a role model to others with sheer hard work and commitment in the business. He wished that Kiran Kumar should get more name and fame in future with his success. Kiran Kumar hoped that the Lalithaa Jewellery showroom would receive full support and encouragement from people as it is offering gold articles at the lowest price. He said hard earned money of people should not be wasted. He said he would win the confidence of the customers by selling top quality ornaments and diamonds. On the first day, several thousands of customers thronged the new showroom and enthusiastically purchased varieties of gold, silver articles and diamonds.